Back in January, before the WaPo's hostility to climate coverage necessitated a split, CapitalClimate pointed out an American Meteorological Society (AMS) conference presentation which thoroughly debunked the myth that climate science in the 1970s was predicting global cooling. That presentation has just been formally published in the current issue (September) of the Bulletin of the AMS as a paper titled, "The Myth of the 1970s Global Cooling Scientific Consensus". The full paper is available at the link, no subscription required. The chart, extracted from the published paper, shows the number of peer-reviewed journal articles "classified as predicting, implying, or providing supporting evidence for future global cooling, warming, and neutral categories" from 1965 through 1979. During the surveyed period, there were a total of 7 cooling, 20 neutral, and 44 warming papers. 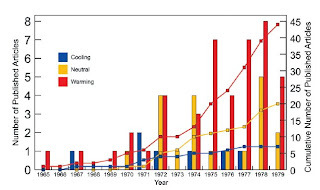 There was no single year in which the number of cooling papers exceeded the number of warming papers. For more links and discussion on the subject of the global cooling myth, see posts by two of the authors at Stoat and RealClimate.